The latest series of ‘The Apprentice’ just came to an end in the UK and, if you were among those following, you’ll know the winner was a man called Mark Wright, who gained a £250,000 investment (roughly $400k for any Americans reading), to spend launching a Digital Marketing Agency. Digital marketing has grown hugely over the last 15 years, and is still very much on the up. Mark – the winner – worked for a digital marketing agency for 18 months, and thus he should have some knowledge of the industry (or, at the very least, know how selling services works within a certain segment of the industry). Finally, Alan Sugar is a big brand capable of reaching the small businesses to whom Mark is planning to sell his services. The show was very entertaining, and there were plenty of positives about it, but one of the most notable elements was the number of basic Digital Marketing errors they made. Here is a selection of 5 glaring errors that may help answer why so many felt Alan Sugar may have made the wrong call. Error 1. No Available Domain Name. The winning business idea was a Digital Marketing Agency called “Climb Online“. It’s not always a deal breaker if you miss out on the ideal domain name, but it certainly helps. 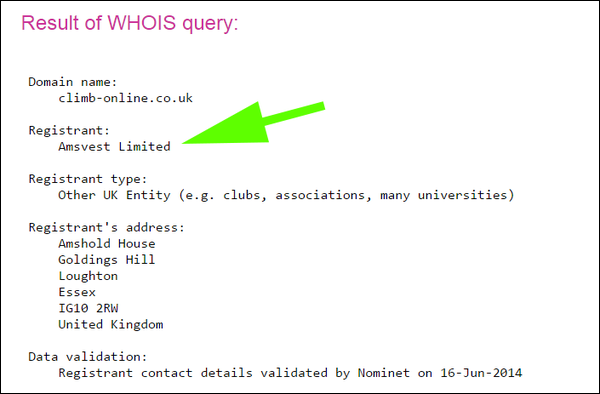 Sadly, neither ‘ClimbOnline.com’ or ‘ClimbOnline.co.uk’ are available: they’re both already owned by rock climbing sites. The rules of The Apprentice meant they weren’t allowed to research this while the episode was being recorded, so you may say it’s excusable to have picked a company name without securing the domain. But, of course, Mark should have had this idea in his head for the entire series, and could have therefore done a few minutes research beforehand and bought a couple of relevant domains. (Incidentally, the business Mark previously worked for was ‘Reach Local’; ‘Climb’ and ‘Reach’ are vaguely similar, and the business was of course also a Digital Marketing Agency offering similar services to his idea. On the one hand that means it’s a proven idea; on the other hand it doesn’t sound particularly original). Error 2. Giving Away The Winner. If they’d wanted, they could have registered a couple of ‘red herring’ domains for the other contestant, but sadly they did not appear to have done that. This basically meant quite a few people figured out the winner early on into the episode. As a side-note along with this, hyphenated domain names are generally seen as harder to make work than those without hyphens (they tend to sell for roughly 1/10th the cost of those without hyphens). The opening episode of The Apprentice got 6.6 million viewers this year. The investment amount was £250,000. £36,000 x 7 = £252,000. In reality very little happened. Neither Mark nor Lord Sugar mentioned the company website at any point. A Google search for the company name didn’t yield any results related to their company. There’s no link in Mark’s twitter bio to the company. (for anyone unaware, that’s the standard page that goes live when the domain was purchased). In other words, millions of people watched a TV show that told them “hey, this guy is offering Digital Marketing Services”, but if you took a look online – the realm of digital marketing – you’d find nothing at all to back any of this up. As a reminder: the winner, Mark, previously worked for a Digital Marketing agency that specialised in lead generation – you would expect him to have set up at least some sort of method of gathering leads for his new business. Ironically, the ‘loser’ did a slightly better job: she at least set up a twitter account for her company (even if the website was still ‘coming soon’). It’s a cover story, and the business will be called Climb Online. In which case it’s madness that they didn’t have the site ready to go at the end of the show at ‘climb-online.com’ or .co.uk. They have gone for a rebrand, and it will no longer be called Climb Online. In which case it’s madness that they didn’t mention this at the end of the show, or at least announce it on twitter & run some Google ads against the phrase ‘climb online’ to communicate the new name to anyone who searched for the name. This is something Mark’s running by himself, under the radar. Unlikely I think. Whichever the answer, it would be very easy to have fixed this. Error 5. Nabbed Twitter Account. The next clanger here is on a level similar to some of the above: a fairly fundamental error that would have been easy to avoid with a bit of foresight. 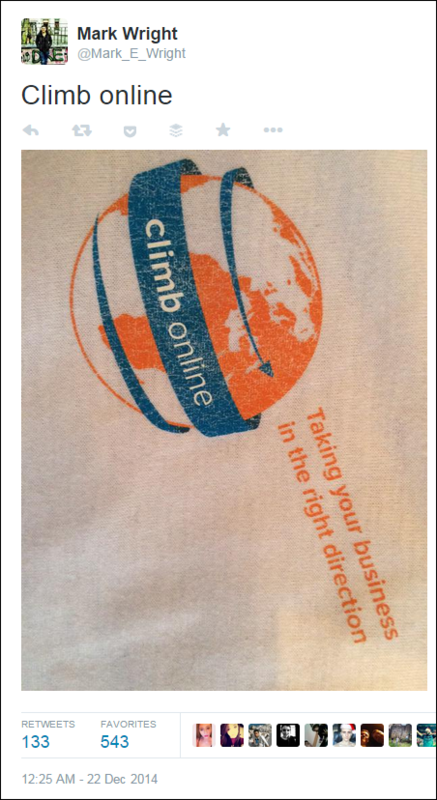 twitter.com/climb_online was registered by someone after the final. twitter.com/wrightondigital was registered by someone after the final. Of course, it’s a TV show & meant for entertainment rather than to display ‘best practice’. There were probably lots of restrictions on what could/could not be done for the purpose of keeping the winner secret. And, of course, there are always going to be errors in something like this & that’s fine, but the errors pointed out here are fairly basic. There were dozens more errors & omissions surrounding this, but those are barely worth mentioning alongside the above. It’s great when Digital Marketing makes it into the mainstream. It would be even better if this were represented in a 100% positive light, which these basic errors do not assist. If Mark had got things right, he could quite easily have gathered enough interest to cover the £250,000 investment immediately. Instead, it seems he’ll go down the old school sales route (he came across as an extremely able salesperson). That’s completely fine, but it’s very sad that a digital marketing business would fail to cover the digital marketing basics above. Ironically, in the post-show interviews, Alan Sugar said one of the reasons he chose to hire the winner was that Google UK’s MD had advised him to do so. It seems he wasn’t aware that the person he was talking about had left Google in the intervening period. Very good luck to them both, and I hope the show has inspired many more people into digital marketing. Do leave any comments below, or share this post with others if you think they’d find it useful. ps. I send out emails occasionally with content like this. Feel free to sign up if you’d like. Haven’t been keeping up with UK TV so it was interesting to read this. Thanks for doing such a thorough write-up. Will be interesting to see how the business is doing in a few months. I have a feeling they’ll grow very fast despite these missed opportunities. I agree so many missed opportunities. Even if the BBC couldn’t promote it before the final, the winner sure as hell could have after the event. I read in the Metro you can start a business from your kitchen bench and turn over a million pounds. A small business paying £3000 per month for service would mean 30ish new clients to hit that number. I don’t know that the service provided from a kitchen worktop would be good enough for me. I also think the left brain/right brain of SEO vs. PPC would mean you’d get good service for one but not so good for the other. I am sure they got Instagram, Pinterest, Flickr, Tumblr, Google+ profiles set up. I know a friend used to do a lot of domain speculation on the X Factor and Pop Idol buying domains for the people who looked promising, but lately Simon Cowell has got this side of things sorted out properly. The one that I thought was interesting was Caroline Flack Twitter account has the look of being hacked https://twitter.com/carolineflack1 but on closer look she has the email addrress of someone at her agency and the domain of the agency, so her win in Strictly will do wonders for others in the same stable. I also think the £3k investment was more likely to be AdWords… Or do most small hairdressing salons in the UK invest so heavily in SEO? Can’t help but feel there are fundamental flaws in the plan and model and that it won to increase awareness of the industry amongst the youth… Maybe. £400 a month lol i do in depth tech seo for small medium and large companies (used to work cleint side for ag lobal 500 company) from a devloper perspective I woudl be charging £450 per day. And if i had swung that sweet year long Data sceince gig 750 -800 per day. nice coverage. he looks like the next traffic power. Only “a bit”, Earl Grey? You’re far too charitable. Impressive. One wonders what the motive was for putting all that time and effort into discovering all those failings? Tracking down coach companies that supposedly used Wrighton Digital Ltd to build their website seems like journalistic dedication bordering on a vendetta? hi, Peter, thanks for the comment. “what the motive was for putting all that time and effort…”: I’d guess the post took about 45 minutes to an hour to write including all the research. You can validate that by figuring out the amount of time between the broadcast & this post going live, and factoring in sleep, I suppose. I’m not sure I’d consider that a vendetta, and I tried to be balanced & positive, including wishing them well, complimenting his salesmanship (etc). It’s not often ‘digital marketing’ is a big headline, so worth taking a look & sharing info on the rare occasions it is. If you look through the other posts on the blog, you’ll find a broad mix of stuff, some of which is along similar lines. On the coach thing: the ‘tracking down’ was simply to search for “wrighton digital” (with quotes) in Google. You’ll see the Avon site somewhere among the results: all of about 20 seconds work. I have to agree with Dan that just hearing something like this being discussed on the apprentice and in fact on tv in general, caught my attention, therefore I don’t believe there was any motive behind it. I think anyone in the industry sat up when the plan was mentioned and I for one know that a lot of what Mark was saying was dubious to say the least, I put it down to nerves. I think old sugar was a bit taken with the whole ‘new’ service industry of digital marketing and actually believed the figures and prospects given, I mean there is no way that a small business will be willing to pay £3000 per month for SEO, a medium or large business; yes but as has been pointed out a beauty salon or book keeper or builder will not do so, even £400 per month is pushing it for most small businesses. I think that there is a lot going on behind the scenes because at the end of the day it is a tv program and sugar sees it as such, I really can’t see him being too bothered with the whole thing of what the brand name is or who has or hasn’t bought a domain name, they basically pick the less controversial contestant as the winner anyway, even though the runner up may have a better idea, luisa zissman had a controversial personal life and there was some smoke that bianca miller may have stolen her idea from someone else. Great write up. The issue I have with it all is the underlying value behind any service he offers. Lord Sugar didn’t invest in him because of his love and understand of SEO and digital marketing, but more the capabilities behind Mark to deliver a ROI positive company. Now there’s how to miss an opportunity! Wrighton Digital Ltd only had one director. I don’t think Sir Alan would put up 250k without being a shareholder. This looks like it could have been his original business plan, or as someone said he’s doing a bit on the side! Couldn’t pass on commenting as I’ve been fortunate enough to be working for the past year helping make the Internet a little roomier to solve exactly the problem described above, new extensions to the existing options .com / .org / .uk / .tv etc. And that’s just some of the new options… it’s all about readability, simplicity and choice. Anyway, I’d love to know your feeling on this, the good the bad and the indifferent! Apologies if you’re written on the subject before, but a search didnt reveal anything. I googled Climb Online this morning and only 2 climbing sites appeared. A really big missed opportunity, how many other thousands of viewers would have done the same. Pretty hard to regard him as one of the best minds in Digital Marketing when he has little or no social presence in the niche before the show. However, he is a great sales man and I assume he will do well with his brand/backing when targeting ‘Joe the Plumber’ and other local trades in keeping them on a retainer. We’ve had a very similar conversation in the office today (http://www.browsermedia.co.uk/2014/12/22/alan-sugar-gets-it-wrong/) in light of the results and were amused by the howlers made with the company name vs. domain issue. The fact that the relevant Twitter handles have been snapped up too just makes is seem like neither Mark nor Alan Sugar were prepared to have ‘digital marketing’ thrust into the limelight, which does indicate a lack of understanding… which leads one to question how much well the business will do. I think it’ll be fascinating to watch this entity grow – whatever name it’s to be known as! Great research/write up. I keep seeing more companies on twitter asking for help with SEO in reply to either Mark or Alan Sugars tweets, but they don’t seem interested in replying. But I imagine they’ll still get a lot of interest anyway. It will be interesting to follow and see if they succeed in this area. It’s not just about selling. Need to keep those clients happy! It is interesting for me currently in process of setting up my own seo biz. Amazed that Sugar would invest in SEO – a total fools game populated by con artists and charlatans. SEO, as any moron knows, is a DYING industry. Google are de-SEOing the Internet. SEO is a mugs game. SEO as you know it might die. But for those of us that move with the times, there will always be a need for businesses to be found by potential customers, whether online or offline. The concept doesn’t change, just the model might do. And those that put all their eggs in one basket (i.e Google) are destined for failure anyway. Great roundup as always Dan. Think it will be really interesting to see how it all goes for him and will be watching with baited breath – I wish him the best of luck. But I can’t really see how Wrighton Digital (.co.uk) can possibly be the rebranded company. It makes no mention of Lord Sugar or The Apprentice. Makes no sense at all. That is 100% of this biz credibility. Would imagine Mark gets shifted to be salesman for one of Sugar’s other businesses if he is that good after a while in any case. Cracking write up Dan. He should have stuck to flogging jacuzzis imo. Great post Dan – couldn’t agree more. He came across as a blagger – I wouldn’t want him working anywhere near any accounts I’ve worked on. I can see him getting out of his depth very quickly. The guy will go through the growing pains but he can manage, work with people, he shouldn’t have a problem being successful. As long as people can create a website and not figure out how get any traffic including search traffic, there will always be a market for seo agencies to sell a service to help get more traffic. Frustratingly, I didn’t watch this series of The Apprentice. I hadn’t even heard of Climb Online until the last episode and the announcement of the winner was announced all over the media. Had I done though, I would have followed this venture with much more interest. Based on what I’ve read however, this sounds like absolute garbage. Not only were there some pretty big clangers in terms of basic business principles as yourself and others have pointed out, the whole business concept sounds like nothing new (okay, not an issue if you’re good at what you do), it’s sounds just like it will be another mediocre agency operated by clueless nobodies in the industry that couldn’t tell their arse from their elbow. And that makes it a very disappointing state of affairs when one of the biggest business tycoons in the country (World?) invests the sum he has into what will likely just be another black mark against the industry. I’m only going by what I’ve read though. It’s enough to demonstrate that no real experience/expertise in this field was shown throughout however. The fact that experience was gained at a previous agency means nothing these days seeing most agencies just train their staff to automate simple tasks and send mass requests to offshore companies to deploy mass link-spam (or low quality guest posts). I wouldn’t be surprised to see the first chunk of their investment being sent straight to TopSEO’s to catapult them to the top of the SEO agency list on their website. Graphics that don’t display well on tablets. Hello Dan, I also ripped this stuppid idea to bits, the concept was all wrong to begin with and just how Lord Sugar swalloed it shows he never intended to invest any money at all unless Lord Sugar is saying he is totally clueless how SEO really works. We were the top placed Europeans in the only real SEO World Championships held in 2007 for the search term GLOBALWARMING 2007. We are also known as top Guru’s on Google Webmaster forums and I could not stop laughing at Marks pitch his outsourcing was Adwords but failed to mention companies would get a better deal going straight to Google themselves. So there was no SEO in the contract it was simply pie in the sky stuff which leads back to Lord Sugar where he stated “I fully understand this Business model” without the domain names secured, please! Your right Dan to point out to many basic mistakes were made to leave just one simple conclusion, Mark’s getting no investment after all because during the filming it was not even his idea and if he knew how the web worked first thing he would have done is a simple search for was the generic domain name which he forgot about all about and no-one even asked him about it in the final boardroom final, shows it was a setup not to invest in him unless we are being told the Sugar empire failed to spot the biggest error in the shows history? They would have been told this on Google Webmaster Forums not from Guru’s but from web newbies, how stupid can this get! How come Lord Sugar never asked him about his competitors yell.com and other internet portals who would have done it at a fraction of the cost if he was correct in understanding the SEO business? Marks vision was for plumbers in London to use his services, lets say for example the keyword search terms were “plumbers in London” in Google UK the first three results are adwords next 5 are google maps which any good SEO guy could do this for free, the next ten page 1 placements 6 are web portals, one is yell.com and Gumtree which is a free service, just where was Mark and his outsourcers going to target and why did no-one in Lord Sugars team point out his plan was nuts even worse if the plumbers website domain name was something like smith and sons? If this is the best young business talent can come up with, UK PLC is in big trouble. Mark began his winning pitch by saying he had risked everything on this, but in the next sentence said he could walk into a £100k sales job tomorrow. So I wondered if his digital marketing ‘expertise’ was bullsh*t as well. Very interesting straw poll and article, the points raised skim the surface of this ‘new’ industry and how simple it is to enter as a new business, despite the experience. A person claiming to know more than anyone with only 2 years sales work experience is a bold claim. It’s going to be an interesting case study to keep and eye on. I’ve just watched the final of the BBC’s The Apprentice on catch up tv and thought I’d give you my take on proceedings. Firstly, I have to say as an overall comment on the show, it seems to have lost the mojo it had in earlier seasons. All too often I found myself thinking it was more a case of who was the best of a bad bunch each week, and which team actually deserved to lose less than the other one. I think the fact the eventual winner was on the losing team seven times speaks volumes (though being no statto, I’ve no idea how past champions have fared losing wise. I would hazard a guess they didn’t get beat as many times). Anyway I digress. Onto the final. I still find it hard to understand why Mark made it all the way. His business plan was more of an “I’m doing this job at the moment. Will you just pay me to do it for you?” type affair. And no one seemed to ever pick him up on his at times brash assertions like the glaring one in the final where he simply said “I know more about online marketing than anyone”. Excuse me? Really? The same way you know London very well as you’ve lived here for two years (one of his earlier equally ridiculous boasts in the week they needed to navigate their way round town to buy various items). At times, the guy comes across as nothing more than a bullshitter and a braggart. Someone who will happily conduct a character assassination on his fellow contestants or slyly manipulate his way into a more favourable role on any given task. So hang on, I should stop there. After all, some might say he has everything it takes to be a success in business. But, if that’s the case – at what cost? Bianca by contrast, was worthy of her place, given that the two front runners for me prior to their firings, Katie and Roisin, were no longer around. However, once she decided that her tights were going to cost what may as well have been a million pounds a pair, it was clear that, despite Mark’s business plan being vastly inferior in so far as it’s just taking a business model that has been out there for years and convincing Lord Sugar that he was God’s gift to online marketing, Bianca was heading for the runners up spot. Yes, she did try to do a u-turn by suggesting that maybe they could be flogged at £6 a pair rather than the ridiculous £35 she first came up with, but by then it was too late. Mark, who, to be fair, can sell (but was told off for lying about his prowess in online advertising earlier in the process), had done enough to win the prize. That said, one can’t help thinking again at how lame the show has become. In the past we’ve had inventors and people with start up ideas that were genuinely original. What have we got now? Someone who has simply taken the business he is in at the moment and asked Lord Sugar to invest because, wait for it, he has a unique selling point. That’s right folks – he’s going to make it a personalised service! Who knew that such a thing existed? (Er, pretty much everyone who works in the service industry and is any good at what they do, that’s who). The hairdresser who allegedly pledged to spend £3,000 a month on Mark’s service (that’s an awful lot of haircuts before you make a profit) just to get onto page one of the Google research results would surely want more than the once a month visit that Mark was pledging to put into his SLA or whatever he’s going to call it. Why, for three grand a month I’d want to see you at least every ten days, probably more until I realised you’re actually not offering anything that isn’t already out there – and probably charging me a lot more for the privilege (I know businesses that spend c. £400-500 a month for a similar service). All in all, I deleted the show from catch up feeling pretty underwhelmed. I was genuinely happy for Tom the Inventor when he won. He was a bit quirky, a bit different, yet fought his corner because he was able to bring something new and innovative to the table. Dr. Leah Totton, the Irish cosmetic skincare queen, also had a bit about her in terms of business prowess. She felt credible, likeable and knowledgeable without ever coming out with crass statements like “I know more about cosmetic surgery and skincare than anyone else in the universe ever” – something that, had Mark been in that business, he’d possibly have rolled out week after week in between times of belittling and denigrating his fellow contestants. Still it’s over now, and, not only does Mark have a £250,000 investment to look forward to, it would seem judging by Ricky Martin and Dr Leah’s cameos on the after show that free orange spray tans and Botox treatments are up for grabs too, if he fancies them. Seriously what have they done to themselves? Leah’s forehead was as stiff as a board and they both looked like extras from a Tango ad. Excellent summary Alconcalcia. Although I didn’t have any more confidence in the originality of Bianca’s plan. I know little about ladies tights, but common sense would suggest that she isn’t the first to have thought of supplying them in different colours. Maybe we are expecting too much though. Lord Sugar said he is looking to make mega bucks. Yet he won’t invest more than £250k. I wish I knew how to do that. PS: I agree about Nick Hewer too. He suggested Bianca’s plan as the better of the two, which I agree with, and Lord Sugar appeared to ignore him. Maybe thats why he left. He doesn’t need Lord Sugar anymore. This is indeed a very interesting article. I like the fact that you have written this article without insulting Lord Alan Sugar and the Winner Mark Wright and most of the content is quite positively highlighting the missed opportunities. I also wish Mark Wright and Lord Alan Sugar success in their new business. I feel it will be a success. Lord Alan Sugar is a very influential person with a strong Brand Identity and good selling skills and personality, I think this is a recipe for a successful venture. I am sure they can come with other innovative names, with available domains. Great article Dan, all points worth making. Whilst we never get much insight into the inner workings of the Apprentice business propositions it did leave me feeling that Mark’s sales skills had come to the fore and done a “job” on Lord Sugar, with little sign of any substance. Leaves me wondering if the true value of whatever performance marketing agency gets created may be in providing in-house services for Lord Sugar’s existing brands. Here is a online marketing company i used to run, but have since restarted with the company since the interest from the Apprentice. Here is a screenshot of the peak from 5 – 10 hits per day to 6000.. They were very slack and got themselves not just easy traffic but also reputation about their professionalism and skills in SEO. Although, Despite all that I think they will be successful. They still have a very good chance at covering their costs and profiting. It would not be hard for them surely to do press releases and TV appearances to promote the business posed as an update on how Mark is doing. Hi Dan, it just gets worse and terrible for this online marketing business model. It seems Mr Wright knows nothing about web design-he gets another un-known web design company to basically copy their homepages coding then makes a pigs ear of the meta tags/alt tags and if that is not bad enough the first big launch STAR51 clothing. If one looks at the html5 coding surprise, surprise its yet another website clone with horrible SEO standards, star51 is not seen for “star 51”. ALT tags for an online shopping site should be a bit more than just two words. In conclusion, we were all correct in thinking its only going to be nutters paying out big bucks just to get noticed as partners of lord Sugar because climb-online.co.uk is not the leading SEO company they claim to be and lastly because Mark is clueless about organic SEO period. This is a great article. So many tricks missed. The major trick missed was that he didn’t go for the tights idea. He always goes for the safest possible business ideas…. Thanks for posting this article Dan, it articulates much of my frustration with this industry and the winner – Mark. During the show my partner would keep asking why I was critical of his great ideas and why did I hate him. This was far from the truth as I found him slyly likeable but incredibly easy to criticize and quite how he seemed to charm and bamboozle Alan Sugar and his team was surprising as so many red flags were evident. He seemed to be Mr Emperor’s New clothes personified. And when ‘someone from Google’ said he was good – presumably as a Salesman as the don’t need any more Tech guys – I did a real time double take. Sadly I felt he was giving the industry a bad name as he came across as a sneaky sales man. However this does not preclude success, the opposite I’m sure. But he cold have been ahead before Day One. In many ways I am glad why should a BBC sponsored programme get so much free airtime and this led to a feeling of guilty schadenfreude. So I’m glad your post has made me feel much less guilty! Sadly I felt he was giving the industry a bad name as he came across as a sneaky sales man. However this does not preclude success, the opposite I’m sure. But he could have been ahead before Day One. In many ways I am glad as why should a BBC sponsored programme get so much free airtime and this led to a feeling of guilty schadenfreude. So I’m glad your post has made me feel much less guilty! I love the apprentice but I had to cringe at all the basic branding mistakes made by climb online. You have covered then perfectly here. Plus I just searched “climb online digital marketing” and his website ranked #7. More proof that his name choice was a disaster and his seo methods are in question!